India - Knowledge Resources for Corrosion Control - Which of the following do you recommend India should use to resolve corrosion management challenges? The automotive industry, and vehicle manufacturing in particular, is experiencing very rapid growth in India. German companies have already established themselves in this market. The aim of the collaboration between the Fraunhofer IST and the IIT Indore is to seek out joint solutions for future challenges in the field of mobility and thus to forge a bridge between Germany and India in this field of research as well. As part of these activities a new IIT Surface Engineering Institute is to be created at the IIT, an Indian university of excellence, with the Fraunhofer IST contributing its expertise to its conceptual basis, structure and start-up. In addition, joint research projects with industry, student exchanges and the implementation of master‘s degree programs in surface engineering are also planned for Indore. The IIT Indore is one of the universities of excellence which were founded in 2009 and is located in the Indian state of Madhya Pradesh. The involvement of the Fraunhofer IST is backed up by the foreign strategy policy of the Fraunhofer Society. “In addition to collaboration with partners of scientific excellence our focus is on following our German and European customers to India. In this way we can continue to be available as competent partners for our industrial clients here, help their Indian suppliers reach the required level of quality and thus boost their competitiveness in the Indian market”, says Prof. Dr.-Ing. Reimund Neugebauer, President of the Fraunhofer Society. Kolkata, Aug 22: The Indian paint industry might witness a slowdown both in volume and value growth this year. The volume growth is likely to shrink to 8 per cent (12 per cent), while the value growth is likely to moderate to 15 per cent (22 per cent) in 2012-13. Estimated at Rs 29,000 crore in 2011-12, the Indian paint industry is likely to be affected by decline in demand and rising cost of production, said, Ramakanth V Akula, president, The Indian Paint Association. “Although the residential, commercial and retail real estate segments have significant growth potential to spur demand in the decorative paint segment, the Indian retail segment outlook during the year continues to be negative buoyed by persistent sluggish demand due to high inflation, higher construction costs and interest costs among others,” he said at the 49th annual general meeting of Indian Paint Industry here on Wednesday. TRIPOLI (Reuters) - Libya's new oil minister is relatively unknown in the industry but brings with him technical expertise to take charge of the OPEC member's economic lifeline after it was restored to pre-war levels. Abdelbari al-Arusi, 51, faces tough tasks ahead: improving security as plans to train former rebel fighters, now guarding oil installations, take hold, dealing with calls for more regional authority in the oil-rich east and threats of strikes. Arusi studied chemical engineering before earning a masters and doctorate in corrosion protection in Britain. He worked at Libya's Sirte Oil for 16 years, an engineer in the field of corrosion at the Marsa El-Brega terminal in the east. Arusi later expanded his responsibilities to inspection, budgets, training as well submitting technical proposals to the country's top oil body, the National Oil Corporation (NOC). From the western town of Zawiyah, he joins the ministry from Libya's Green Holding Company, where he was an executive since the end of last year. Rust (Corrosion) can be costly for a bus body. Each bus fleet faces specific conditions that can accelerate corrosion - salty air in the coastal side. There is no awareness for corrosion to fetch after-market services and maintenance that extend the life of a school bus. Corrosion of steel structures will vary from place to place. TAMIL NADU GOVERNMENT GAZETTE Notification No 243 dated 31 Aug 2012 for TAMIL NADU MOTOR VEHICLES (REGULATION AND CONTROL OF SCHOOL BUSES) - SPECIAL RULES 2012 - [G.O. (Ms) No. 643, Home (Tr.VII) Department , 31st August 2012.] - Clause 6. Construction and Maintenance of the School Buses.— (2) Painting: Every School Bus shall be fully painted as specified in rule 349A of Tamil Nadu Motor Vehicles Rules, 1989. Painting is viewed as colouring mean to segregate school buses from other categories. There is no mention on corrosion of steel body and selection of proper paint system to safeguard and extend the life of school buses. The Special Cell that conduct the testing and inspection of school buses according to the Chapter VII of the Motor Vehicles Act, 1988 shall be properly trained in assessing corrosion defects of various steel components of the entire bus body. 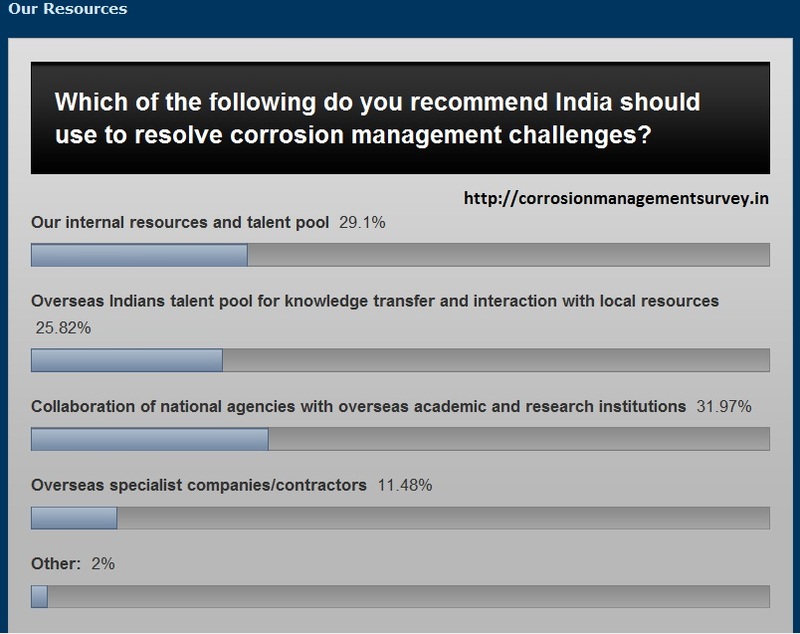 India - Environmental Clearance Requirement - Is Corrosion of Materials overlooked by Regulatory Agencies/Asset Owners when they perform Environmental Audit/Impact Assessment? Environmental Clearance (EC) as per the EIA Notification 2006, Ministry of Environment & Forests calls for incorporating necessary environmental safeguards at planning stage. There is no specific reference on Corrosion of Materials found in EIA Notification. Is it necessary to include Corrosion as an Environmental Hazard and recommend for suitable prevention practices in Environmental Clearance process? Environmental Impact Case Reported in the News Hindustan Times and The Hindu. There are numerous cases of water leakage reported across the country. 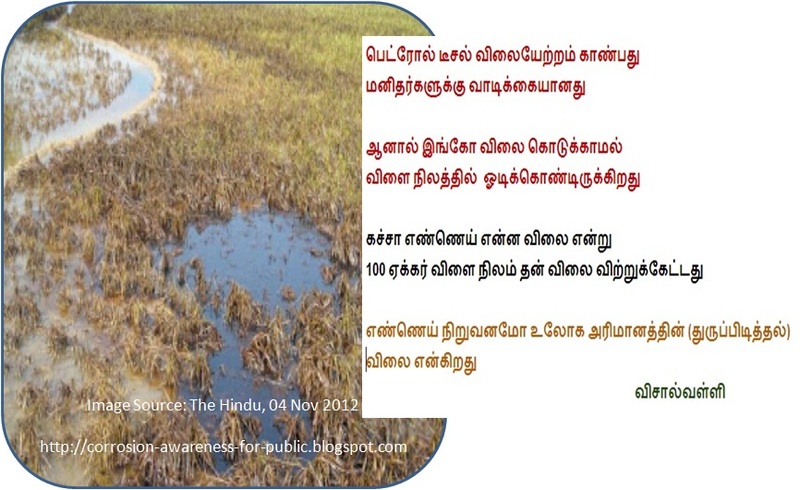 Oil spill in 100 acres farmland in Nagapattinam, Tamilnadu. A pipeline carrying crude oil for refining developed cracks and spilt oil in about 100 acres of farmland in a village in Nagapattinam district, officials said. They said people of Manjavadi village detected the leak after they found their farmlands flooded with oil. The oil was being transported through pipeline from the Oil and Natural Gas Commission owned oil well at Adiyakkamangalam to Narimanam for refining, they said. Officials said it was not clear whether the pipe had broken due to recent heavy rains or the soil becoming loose. ONGC officials said the pipes might have got corroded due to the saline condition in the area. Ruptures from the old pipeline at intermittent points have been a recurrent feature causing anxiety to the farmers. ONGC officials said the pipes might have got corroded due to the saline condition in the area. The Alathur Pharmaceutical Manufacturers Association (APMA) in Tamil Nadu and the Central Drug Research Institute under the Council of Scientific & Industrial Research (CDRI-CSIR) signed a memorandum of understanding (MoU) to carry out combined research & development activities in formulations of chemicals and nutraceuticals of natural and synthetic origins, in a broad ranging cooperation basis. As per the agreement, both the parties, APMA and CDRI-CSIR, will transfer knowledge of technology, scientific researches and other technical facilities as solutions to the troubleshooting problems in formulation development, analytical development and manufacturing of bulk drugs for all the member units in the pharma cluster to be established at Alathur. The MoU was signed by Dr Rajendra Prasad, chief scientific officer of CDRI-CSIR, Lucknow and S Lekshminarayanan, secretary of APMA in the presence of Dr Anil Kumar Saxena, nodal scientist for MSME pharma cluster. Regarding the agreement, the officials of the MSME and CSIR held discussion with the members of the Cluster project at Alathur two months ago. According to them development of cluster is the union health ministry’s initiative to help the small and medium scale pharma units in the country in finding remedies for their serious problems. The MoU suggests that CDRI should provide necessary technological support for the units established at the Alathur pharma estate. Further, the institute will give training to the cluster members in R&D and to conduct seminars for awareness on how to operate the cluster. “The purpose of the agreement is to establish mutual interest between the pharma cluster and the CSIR-CDRI for facilitating technological interventions to enhance the innovation capacities of the MSME units. It will help both the organisations for collaboration in areas of common interest by participating in their academic, scientific and research activities,” said Lekshminarayanan. According to him, they will jointly carry out combined research and development activities and mutually assist in pharmaceutical formulations in novel drug delivery system, and on new or improved process of known products of synthetic and plant origin. Together, the organisations will develop scientific collaboration with national and international universities and exchange their faculties for knowledge sharing. AkzoNobel India has set up a well-equipped ‘analytical centre” to provide better products and faster services to its customers. The centre has been located at the company’s international research lab in Bangalore, according to AkzoNobel spokesperson. Called India Analytical Centre (IAC), the centre will leverage AkzoNobel’s global and local resources to provide quality analytical services to meet the needs of AkzoNobel India’s coatings businesses. The centre will have the ability to evaluate and certify raw materials, intermediates and products used within the country. IAC will help in evaluating AkzoNobel products to meet local regulations and specifications. It will also support in making the company a leader in coatings industry in India by providing the right colour solutions. The centre is equipped with instrument technologies like spectroscopy, critical in maintaining the quality standards in raw materials such as resins; rheology used to study the flow and viscosity profile of products in product development and application, and those for thermal analysis and corrosion studies which allow technicians to evaluate product durability under different conditions and over different substrates.